The site of the camp at Boyndie. A controversial traveller camp could be approved next week despite more than 250 people signing a petition to block it. The 15-pitch stopover site at Boyndie’s former council depot was first proposed in June this year by local man Frank James. But almost immediately concerned locals started lodging objections against the scheme. A petition was also started which attracted about 300 signatures. 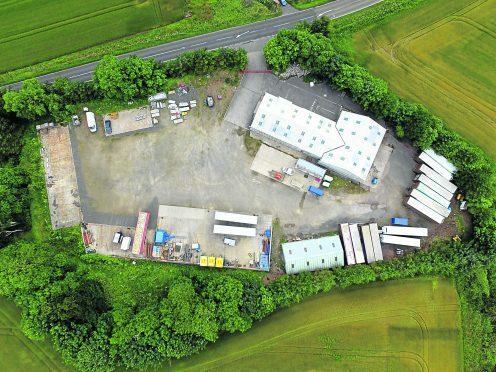 Concerns included the camp’s closeness to the A98 Banff to Portsoy Road and the fact it was already in use as a carpet warehouse without the necessary planning permission. The retail aspect of the site was only approved – retrospectively – by the authority last week. Despite this, the scheme is in line to be given the go ahead by Aberdeenshire Council when councillors meet on Thursday. Banff and Buchan councillors have already offered it their “broad” support. Backing the venture last month, councillor Mark Findlater claimed that stopover sites were a necessity. Meanwhile, a spokesman for the local authority’s planning service said that not all objections had come from people who will be affected by the site. He added there was no “accident history” for the area. In his report, which will be discussed on Thursday, Stephen Archer has recommended councillors approve the camp. He said the development was “acceptable” and that there were “no material considerations” which indicated that permission should be refused.